A fortunate few within the gaming community got the chance to sit down and play next-gen Grand Theft Auto V. There's loads of new details on what to expect for both the single player and online experience. So without further adieu, let's get right to it. IGN is up first with an article titled, "Grand Theft Auto 5: A New Perspective". 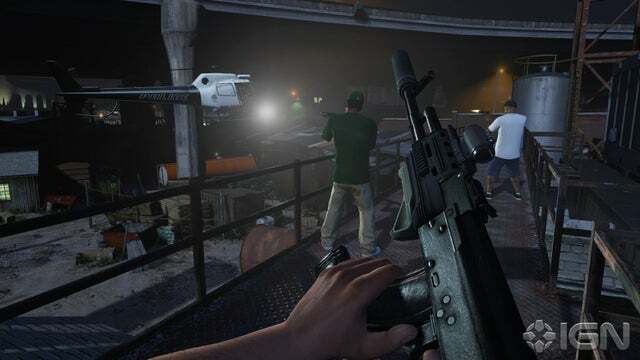 You read that right, GTAV next-gen will feature a FIRST PERSON MODE! "Police cars are stacking up in the cul-de-sac below and a helicopter is hovering somewhere overhead. I can’t really see where it is, but I feel its presence, and the cops open fire. So I make a run for it, vaulting over a fence into a parking lot, where I jack a car, climb in, and as I look down to hot-wire it, I see there’s a bullet hole in my in my forearm and blood is running out. I’ve never had a GTA experience like this before, and that’s because it’s all playing out in the first-person." "Nelson and his team have worked tirelessly to make this new perspective not only work but feel totally immersive. The fastidious attention to detail that originally went into the creation of GTA 5 is once again evident in the way first-person mode has been executed. When you step inside a car for the first time and settle down into the driver’s seat, you’ll notice the vehicle has a thoughtfully-designed dashboard – the speedometer and rev counter all work and, in some of the more high-end cars, digital displays even show the name of the radio station and song you’re listening to. Your character will even bob his head to the music. And that level of detail extends to every car, boat, and plane; they all have unique cockpits, so you’re never just plonked behind the same wheel. Hop on a bike or jump into a helicopter, and your character puts on a helmet or a set of goggles that authentically restricts your view and muffles the ambient noise of the world. It’s these details, seemingly incidental, which cement the illusion and make GTA 5’s first-person mode feel like a substantial part of the experience, rather than a bullet-point on the back of a box." Be sure to click on the link above to read the full article and check them out 15 new screenshots in the gallery here. There' also a video accompanying the article worth checking out if you want to see it in action. Up next is the article from Computer and Videogames, titled, "Hands-On with GTAV PS4: Rail guns, FPS mode, and more". Be sure to check out their GTA O'Clock hour long special video as well. "Sure, cruising around Downtown Los Santos in a Pegassi Zentorno can almost look and feel mundane (well, relatively), until your attention is caught by a comically-fluffy cat eye-balling you at the traffic lights, as it ambles up a side street. Good / bad news: cats aren't bullet-proof, but we didn't put it to the test. There's over 20 new species of wildlife, but it's those in bushy new-gen fuzz that catch the eye." "GTA Online lets you create FP-only races and death-matches, with the long-anticipated Heists now, apparently, on the near-horizon. Call of Duty-style contests? Almost certainly, and Rockstar have the scope to tackle their rivals on all fronts with custom DLC and user-created FP content." "We haven't even talked about the 100s of new songs our hours of new DJ chatter (Back Street Boys 'Tell me Why', anyone? ), or the ability to dip into first-person at any time (tap the PS4 face pad), or the amazing new pedestrian chatter (we tailed a guy fobbing off his boss in a 30 second phone call), or the soft, haunting glow of lightning, or the new smog effects, or the fireflies in the forest, or swimming with a whale." The article has 23 new screnshots to browse as well or check them out in the gallery here. 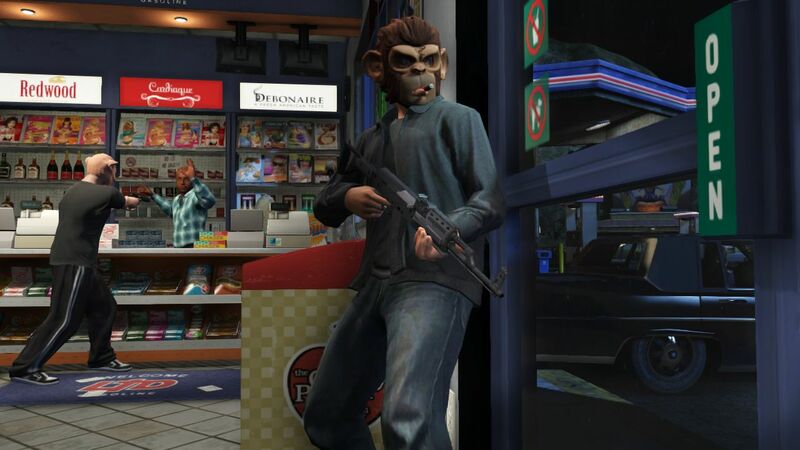 Be sure to check out the Forums if you want to discuss next-gen GTA! Part 2 of IGN's preview includes a comparison video highlighting the amazing new detail of the new-gen GTA V.
The PC version is coming January 27th, 2015. GTA V Next-Gen Previews/Details - Various publications preview next-gen GTAV, and with it comes details on what to expect when you make the jump.